The 2nd in Robert Taylor's pair of prints commemorating the Ninth Air Force. 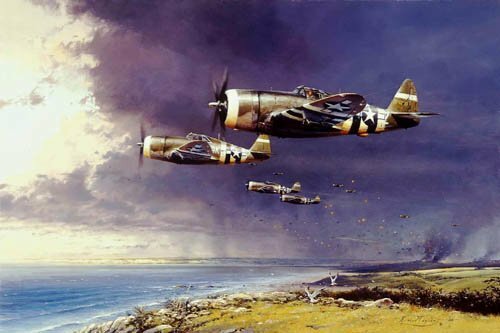 A flight of P47 thunderbolts of the 404 Fighter group, 9th Air force, clear the target area after a low-level attack on the airfield inland from Limited Edition Havre, Normandy, 1944. Tracer winds up towards them from ground defences and almost all the aircraft have taken hits. Ground-attack pilots went in low, did the job and got our fast!